Another new colorway of Steph Curry’s first signature has been spotted! 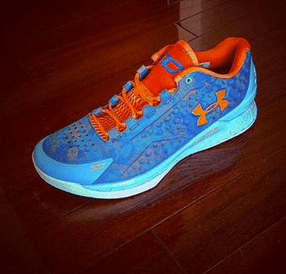 Check out the Under Armour Curry One Low ‘E24’ colorway seen below. The colorway is inspired by the AAU basketball camp called the Elite 24 that is held by Under Armour. The blue look looks like it’s been pulled from one of the logos for the camp. The rest of the shoe is pretty wild, with a camo print on the upper and a loud orange tongue. Stay tuned for more release info on the Under Armour Curry One Low ‘E24’. Let us know your thoughts in the comments below. Looks like a “Knicks” colorway imo. Meh…not a fan. Kind of like the Select30 color way. Too busy, too loud. Crap these are ugly imo.